Soylent Green is a film about people. LOT'S of people. The premise is simple: In the future, overpopulation has reached such a stage, that there's simply not room for more people. There's people everywhere. Everywhere! Remember the Where's Wally books? That was nothing. 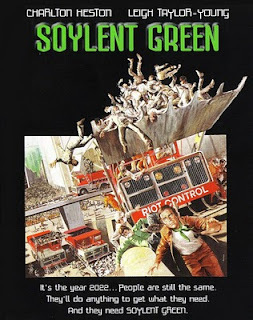 In the future prophesied by Soylent Green, there's no space to move. There's no space to breathe. And there's nothing to eat. Except Soylent Green. Charlton Heston was presented as the new scapegoat to blame for modern times excessive violence, in Michael Moore's Bowling for Columbine, but if you see this film, you will see that there's more to the man than the supposed reason for our generation's decline. He was once also a great actor. It's a wonder it hasn't been remade yet, so I advice you strongly to see this cult film, before they ruin it.